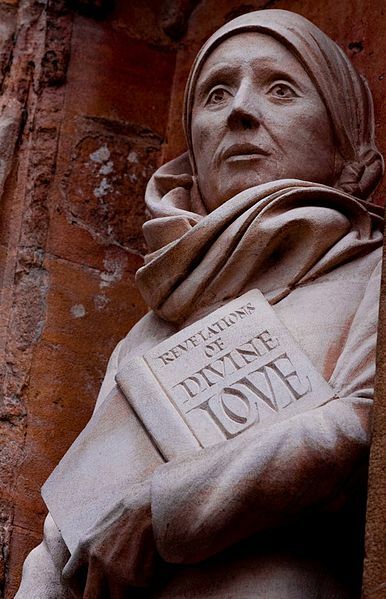 Julian of Norwich is a medieval English mystic who celebrated “Mother Jesus.” It’s not known if Julian herself was queer, but some of her ideas were. 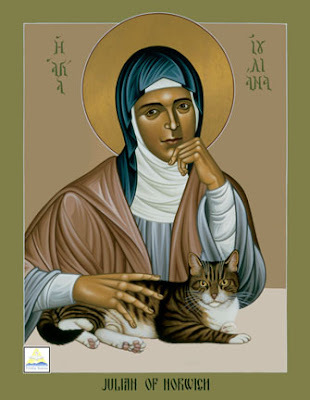 Julian is often listed with LGBT saints because of her genderbending visions of Jesus and God. Her feast day (May 8) always falls near Mother’s Day (May 11, 2014). Her discussions of Jesus as a mother sound radical even now, more than 600 years later. In today’s understanding, Julian’s Jesus can seem to be transgender! Her omnigendered vision of the Trinity fits with contemporary feminist and queer theology. A longstanding legend tells of Julian’s friendship with her cat companion, depicted in the paintings at the top of this post. As an anchoress, Julian probably lived alone. It is said that the only other being to share her room was a cat -- for the practical purpose of keeping it free from rats and mice. The other icon of Julian and her cat was created by Robert Lentz, a Franciscan friar based in New York. Known for his innovative icons, he was rebuked by the church for painting LGBT saints and God as female.